The Brazilian superstar’s lucrative wage following a record-breaking transfer further highlights the gender gap that exists in sport. 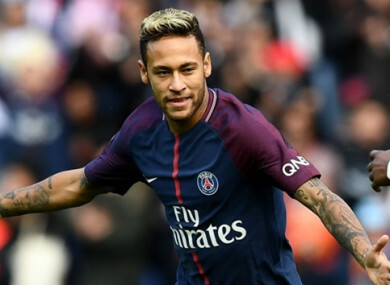 NEYMAR’S LUCRATIVE SALARY at Paris Saint-Germain matches the combined earnings of performers across the top seven leagues in the women’s game, a new study has revealed. Sporting Intelligence have published their annual salary survey looking into the wages of leading teams and individuals across the sporting spectrum. Their findings help to highlight the inequality which exists between the male and female games, particularly in football. Looking into the employment status and pay of thousands of athletes around the world, Sporting Intelligence have shown how far ahead the likes of Neymar are when it comes to generating the most money. Having completed a record-breaking €222 million transfer from Barcelona to PSG over the summer, the Brazilian is reportedly set to earn £32.9 million over the course of the 2017-18 campaign. That figure is purely what he will pull in from his playing contract and does not take into account the millions he receives from commercial deals. It is, however, still enough to see him earn almost exactly the same as 1,693 female players turning out in France, Germany, England, the United States, Sweden, Australia and Mexico combined. While PSG sit fifth on the list of the world’s highest-paying sports teams, with an average annual salary of over £6.4m and with only Barcelona above them in footballing terms, Lyon top the women’s list at just £145,000-a-year. In England, those in the FA Women’s Super League receive an average salary of £26,752 compared to the £2.64m paid to their male equivalents. The figures make for startling viewing and Ruth Holdaway, chief executive of the Women In Sport charity, believes it is down to the respective governing bodies of sports across the globe to address the issue. She said in The Guardian: “We’d love to see more governing bodies valuing their female athletes the same as their male athletes. “It’s not just about equal pay; it’s about the message that sends out about how much women are valued. Football is a long way short of equality at present, with Neymar’s riches just one example of the gulf that continues to exist between genders. Email “Neymar earns the same salary at PSG as every woman in top seven leagues combined”. Feedback on “Neymar earns the same salary at PSG as every woman in top seven leagues combined”.